JOBS tending to one of the UK’s prime maritime heritage attractions are under threat after museum bosses announced plans to ‘restructure’ the business. Fears have been raised that 15 staff at HMS Warrior could be sacked, with further fears the volunteer workforce could also see major cutbacks. It comes a month after the National Museum of the Royal Navy (NMRN) took over the running of the ship, based at Portsmouth’s Historic Dockyard. A meeting held between museum chiefs and the 40 staff at the site has since been held. During this, workers were told there would be a restructuring of how the museum operates in the wake of the takeover from The Warrior Preservation Trust. A source at HMS Warrior, who asked not to be named, said: ‘The morale of the ship just went down to minus two degrees. The ship’s heart is being ripped out. ‘I’ve been here for four-and- a-half years and we’re like a family. When I spoke to one of the staff members after this meeting they said that 15 people could be going. The News understands that a number of roles currently on Warrior are set to be shifted, with some aspects being melded with jobs at the Historic Dockyard. Under the consultation into the restructure, some workers could be taken away from Warrior, with their skills being used on the likes of HMS Victory. However, some posts may no longer be needed, with the roles being made redundant. Fears have also been raised the number of volunteers could be cut in the restructure. Currently there are about 70 on the books, with an average of 10 working every day on Warrior guiding visitors around the ship. 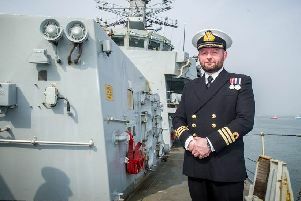 But a source claimed the daily number of volunteers needed for Warrior could be cut to four, with other supporters being given roles elsewhere in the dockyard. ‘This is ridiculous because it will mean we will only have one volunteer per deck – they will have to deal with an entire deck of visitors by themselves,’ the source said. A spokeswoman at the NMRN did not confirm if there were plans to cut jobs or reduce volunteer numbers. HMS Warrior was built in 1860 and was Britain’s first iron-clad battleship. She arrived at the dockyard 30 years ago and welcomes about 330,000 visitors a year. As previously reported, NMRN has temporarily suspended volunteers from working at the Explosion! Museum in Gosport amid on-going changes.